Though the Big Bang and the birth of the universe as we know it – or, at least, *think* we know it – all happened way before any of us were born, we can still piece together the universe’s history from the starlight we observe today. Figure 1: An image of the supernova remnant Cassiopeia A from NASA’s Chandra X-ray Observatory. Image Credit: NASA/CXC/SAO. Scientists believe that the very first stars in our universe were born a long, long, long, long, long time ago, when the universe was “just” a few hundred million years old (much younger than the universe’s current age of nearly 14 billion years). These first stars were huge – scientists believe they might have been a hundred or so times more massive than the Sun. They were born of gas containing only hydrogen, helium, and tiny traces of lithium – the only three elements that were even around after the Big Bang. All elements heavier than hydrogen and helium in the universe, which astronomers refer to collectively as “metals”, were forged later, after these first stars exploded into brilliantly-bright supernovae and expelled the first heavier elements out into space. These first metals can be traced in the “second-generation” stars, which are the extremely metal-poor stars that were born after the first stars went supernovae. Scientists study second-generation stars in our Milky Way to learn more about how they formed and how the first stars led to their birth. In today’s astrobite, we consider the story told by a special class of second-generation star: the carbon-enhanced, metal-poor (CEMP) stars. CEMP stars are metal-poor but have relatively high carbonicity, which means they have enhanced amounts of carbon compared to their iron content. Specifically, we look at CEMP-no stars, which are CEMP stars that also have relatively little barium with respect to iron. These CEMP-no stars are believed to directly represent the chemical composition of the environment they formed in. As of yet though, it’s not clear how these carbon-enhanced stars formed. One theory says that CEMP-no stars were born after faint supernovae. 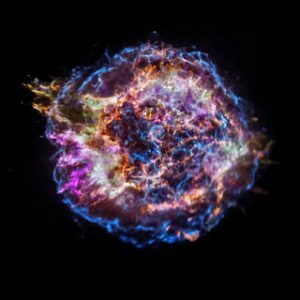 Since faint supernovae are known to expel relatively less iron than more “normal” supernovae, and since CEMP-no stars have carbon that’s enhanced relative to their iron content, then it’s possible that CEMP-no stars show carbon enhancements because they were born after faint supernovae. However, it’s not clear what percentage of the universe’s first stars may have exploded as faint supernovae. It’s also not clear if that percentage was enough to explain all of the CEMP-no stars we expect there to be in the universe. Today’s authors consider a different perspective. They question if the carbon enhancements observed for these CEMP-no stars might be explained in part by inhomogeneous metal mixing – aka, an uneven distribution of metals in the environment where they formed. So far, not much research has been done on the effects of inhomogeneous mixing of elements in the early universe. So today’s authors used theory and modeling to test their scenario, in which inhomogeneous metal mixing leads to the formation of a CEMP-no star. One of the universe’s first stars explodes into a supernova. The explosion eventually leads to overdensities in the surrounding gas, such that some parts of the gas are ‘clumpier’ than others. Due to inhomogeneous mixing after the explosion, these clumps have differing elemental abundances from each other. A clump with higher carbonicity relative to another nearby clump collapses and forms stars. The newly-formed stars send out energetic photons. These photons pierce the other nearby clump, break apart the molecules contained in that nearby clump, and thus stop that clump from collapsing and making its own stars as well. Figure 2: A graphic illustrating the authors’ scenario. In the first panel on the left, a first star explodes into a supernova that has a typical carbon abundance. In the second panel we see how, due to inhomogeneous mixing, the supernova leads to a clump of gas that has higher carbonicity (along the top row) and a clump that has less carbonicity (along the bottom row). Then in the third and fourth panels, we see that the clump with higher carbonicity produces CEMP stars. These stars send out energetic photons that prevent the clump with less carbonicity from producing stars as well. From Figure 1 in the paper. The authors’ work culminated in an analytical, closed set of equations that related the carbonicity of the clump to the difference in carbonicity (and thus the level of inhomogeneity) between that clump and its nearby clump. They found that this relationship depended most strongly on the difference in carbonicity and the physical distance between the two clumps. 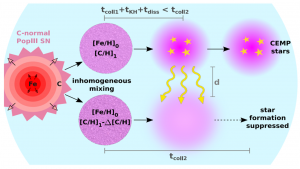 Figure 3: Predictions of how well the authors’ inhomogeneous metal mixing scenario explains the formation of 64 CEMP-no stars that have been observed. The x-axis shows the distance between the two clumps in parsecs (pc). The y-axis represents the minimum difference in carbonicity between the two clumps (where higher numbers mean a larger difference) that would allow this scenario to produce a CEMP-no star. The black line is the 50% line. So for example, if we pick a spot along the black line, then 50% of the observed CEMP-no stars in the survey could be explained by the corresponding distance and difference-in-carbonicity values, while another 50% would require a larger difference in carbonicity. The red and green areas explain 0% and 100% of the observed CEMP-no stars, respectively. So if all of the clumps resulting from the first stars’ supernovae fell into the green region, then this scenario would explain 100% of the CEMP-no stars observed in the survey. From Figure 4 in the paper. Figure 3 predicts how well this scenario could explain the formation of 64 CEMP-no stars that have been observed. 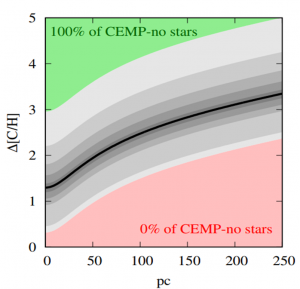 The authors find that for their standard model, with a clump distance of 30pc and a difference in carbonicity of about 1 unit, about 11% of observed CEMP-no stars can be explained by this scenario. They stress how they’re not saying that all CEMP-no stars in the universe formed through this inhomogeneous pathway. They’re merely proposing that this is how a certain proportion of the CEMP-no stars we observe today may have formed. They look to future 3D simulations to dive deeper into inhomogeneous mixing, and investigate how efficiently the process might have occurred in the early universe. But in the meantime, if we couple this inhomogeneous pathway with the faint-supernova pathway we discussed at the beginning of this astrobite, then we may not need so many faint supernovae after all to tell the story of how these CEMP-no stars came to be.